10kg mass of NWA 5000. History: Found in July 2007 in southern Morocco and provided to Adam Hupé in October 2007. Physical characteristics: A single, large cuboidal stone (11.528 kg) with approximate dimensions 27 cm × 24 cm × 20 cm. One side (which appears to have been embedded downward in light brown mud) has preserved regmaglypts and is partially covered by translucent, pale greenish fusion crust with fine contraction cracks. Abundant large beige to white, coarse-grained clasts up to 8 cm across (some of which have been eroded out on exterior surfaces of the stone, likely by eolian sand blasting) and sparse black, vitreous clasts up to 2 cm across (containing irregular small white inclusions) are set in a dark gray to black, partially glassy breccia matrix. One partially eroded clast exposed on an exterior surface contains both the coarse grained beige lithology and the more resistant black, vitreous lithology in sharp contact. Petrography: (A. Irving and S. Kuehner, UWS) Almost monomict fragmental breccia dominated by Mg-suite olivine gabbro clasts consisting predominantly of coarse-grained (0.5-2 mm) calcic plagioclase, pigeonite (some with fine exsolution lamellae), and olivine with accessory merrillite, Mg-bearing ilmenite, Ti-bearing chromite, baddeleyite, rare zirconolite, silica polymorph, K-feldspar, kamacite, and troilite. Some gabbro clasts have shock injection veins composed mostly of glass containing myriad fine troilite blebs and engulfed mineral fragments. Black, vitreous impact melt clasts consist of sporadic, small angular fragments (apparently surviving relics) of gabbro and related mineral phases in a very fine grained, non-vesicular, ophitic-textured matrix of pigeonite laths (up to 20 microns long × 2 microns wide) and interstitial plagioclase with tiny spherical grains of kamacite, irregular grains of schreibersite and rare troilite. Geochemistry: Gabbro clasts: plagioclase (An96.1-98.0Or<0.1), pigeonite (Fs32.0-64.5Wo6.7-13.1; FeO/MnO = 51.1-62.0), olivine in different clasts range from Fa23.9-24.2, Fa40.4 to Fa58.8 (with FeO/MnO = 81-100), chromite [(Cr/(Cr + Al) = 0.737, Mg/(Mg + Fe) = 0.231, TiO2 = 5.9 wt%], ilmenite (4.1 wt% MgO). Bulk composition: (R. Korotev, WUSL) INAA of 6 subsamples gave mean values of 5.3 wt% FeO and 0.4 ppm Th. Classification: Achondrite (lunar, feldspathic breccia). Specimens: A total of 40.2 g of sample, two polished mounts and one large polished thin section are on deposit at UWS. AHupé hold the main mass. Arai T., Yamamoto A., Ohtake M., Matsunaga T., Haruyama J., Hiroi T., Sasaki S., and Matsui T.
(2011) Lunar crustal mineralogy inferred from lunar meteorites and Kaguya data (abstract). The 34rd Symposium on Antarctic Meteorites, p. 3-4, Tokyo. Macke R. J., Britt D. T., and Consolmagno G. J. (2011) Density, porosity and magnetic susceptibility of achondritic meteorites. 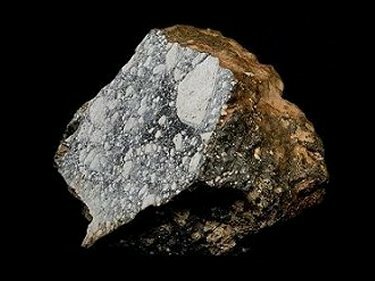 Meteoritics & Planetary Science 46, 311-326. Korotev R. L., Jolliff B. L., and Zeigler R. A. 41st Lunar and Planetary Science Conference, Houston. Macke R. J., Kiefer W. S., Britt D. T., and Consolmagno G. J.
Goldschmidt Conference Abstracts 2009, A365. 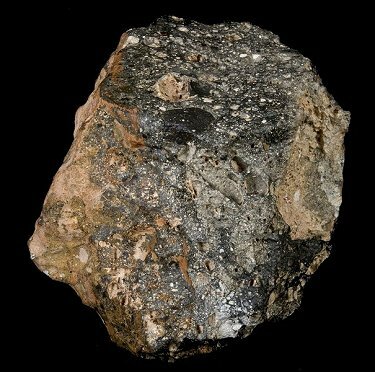 Exposure history of lunar meteorite Northwest Africa 5000 (abstract). Humayun M. & Irving A. (2008) Impactor metal in gabbroic lunar meteorite Northwest Africa 5000. Goldschmidt Conference Abstracts 2008, Geochimica et Cosmochimica Acta 72, 12S, p. A402. 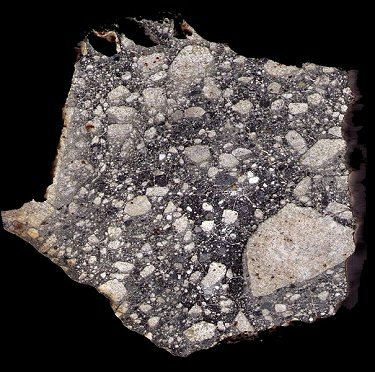 Irving A. J., Kuehner S. M., Korotev R. L., Rumble D. III, and Hupé A. C.
(2008) Petrology and bulk composition of large lunar feldspathic leucogabbroic breccia Northwest Africa 5000 (abstract). 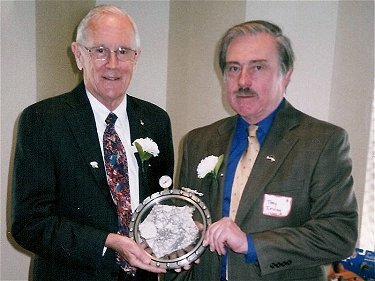 Moonwalker, Charles Duke (left) and Dr. Tony Irving presenting the Ambassador Slice at a promotional event for the Planetary Studies Foundation in Chicago. 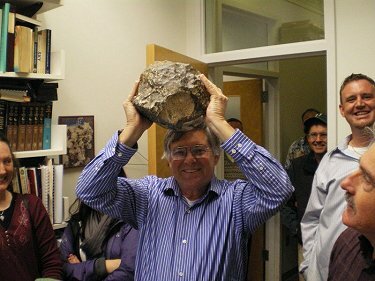 Dr. Don Brownlee of NASA Stardust Mission fame holding Northwest Africa 5000 in triumph over his head. Rear view of Northwest Africa 5000 Main Mass. Exposed matrix on NWA 5000 main mass.